On the weekend before Jonathan Holloway’s first Melbourne Festival in 2016, he flew to the US, telling as few people as possible so as not to “leave a breadcrumbs trail” for what he was checking out. Flying into San Francisco, he saw the world premiere of Layla and Majnun, a dance-opera by the Mark Morris Dance Group and Yo-Yo Ma’s Silkroad Ensemble. “I met Yo-Yo Ma, [American choreographer] Mark Morris, who I know really well, and [British contemporary artist] Howard Hodgkin, who designed it, and I saw the work, which we had co-commissioned, and I was absolutely thrilled,” enthuses Holloway. He then flew to New York and saw three hours of Taylor Mac’s 24-hour performance A 24-Decade History of Popular Music. He then jetted back to Australia, walked straight into an ABC interview and had to behave as if he was fresh as a daisy, rather than reeling with jet lag. But it was all worth it. Taylor Mac proved a sensation at last year’s Melbourne Festival and picked up two Helpmann Awards, Layla and Majnun is one of the centrepieces of this year’s Festival, as announced in June. The visually beautiful production is based on an opera by the early 20th-century Azerbaijani composer Uzeyir Hajibeyli. Inspired by a story which first appeared in oral versions in the fifth century, it tells a tale of an impossible young romance that leads to the lovers’ untimely deaths. Morris has described it as “an enlightening tragedy – a visually, musically and choreographically unified and self-contained concert piece”. 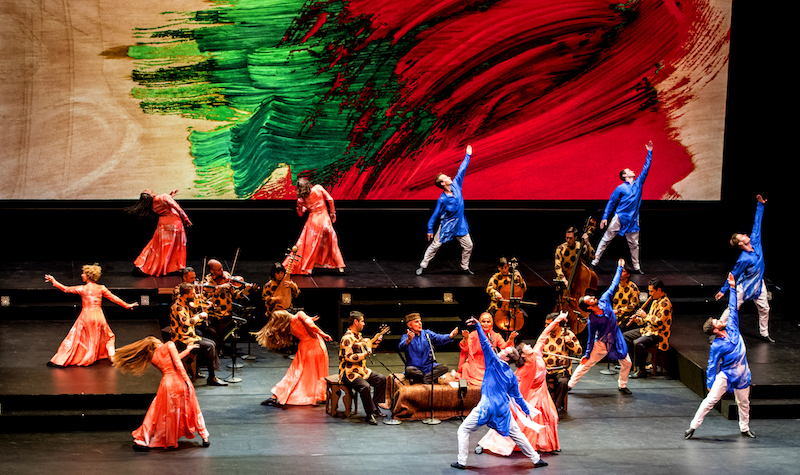 The work is performed by musicians from the celebrated Silkroad Ensemble together with 16 dancers from the Mark Morris Dance Group. At the heart of the work are Azerbaijani mugham vocalists, Alim Qasimov and his daughter and protégée Fargana Qasimova. “It’s a knock out. It’s just so emotional and moving and beautiful and thrilling, and Mark’s dance is like nothing he’s done before,” says Holloway. This year’s Melbourne Festival is Holloway’s third. He has one more to come having announced that he will leave Australia and head home to Britain at the end of the 2019 Festival. Having got Silkroad Ensemble to Australia for the first time with Layla and Majnun, Holloway has them performing in concert too. With members hailing from 20 countries, and using traditional instruments from Armenia, Mongolia and Japan, their repertoire crosses the contemporary musical landscape. Another key work in the music program is Lagrime di San Pietro performed by the Los Angeles Master Chorale – one of the world’s great choral ensembles. 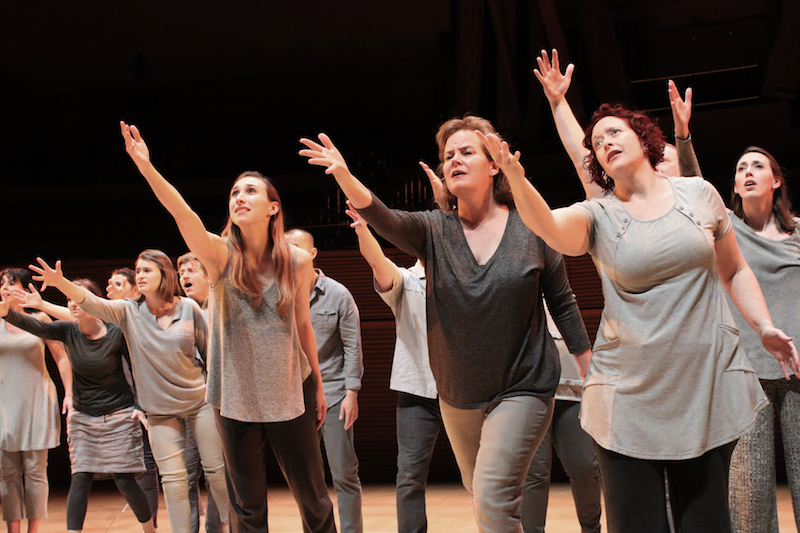 Written by Orlando di Lasso (1530 – 1594), conductor Grant Gershon and director Peter Sellars have brought a modern lens to the a cappella masterpiece. Running 75 minutes, it will feature 21 singers and be conducted by Jenny Wong. Tan Dun will conduct the Melbourne Symphony Orchestra and Chorus performing his own work Buddha Passion, the world’s first passion set to the teachings of Buddha. “It’s the beginning of three years of projects with the MSO which will get bigger as we go along,” says Holloway. Sir András Schiff will give a piano recital as part of his Musica Viva tour, Australia’s Van Diemen’s Band will perform a concert of music by Nicola Fiorenza, Alessandro Scarlatti and Francecsco Geminiani, and in a more quirky musical event, Asuna, a multi-instrumental sound artist from Japan, will present his famous work 100 Keyboards, featuring 100 cheap plastic keyboards in the same key. 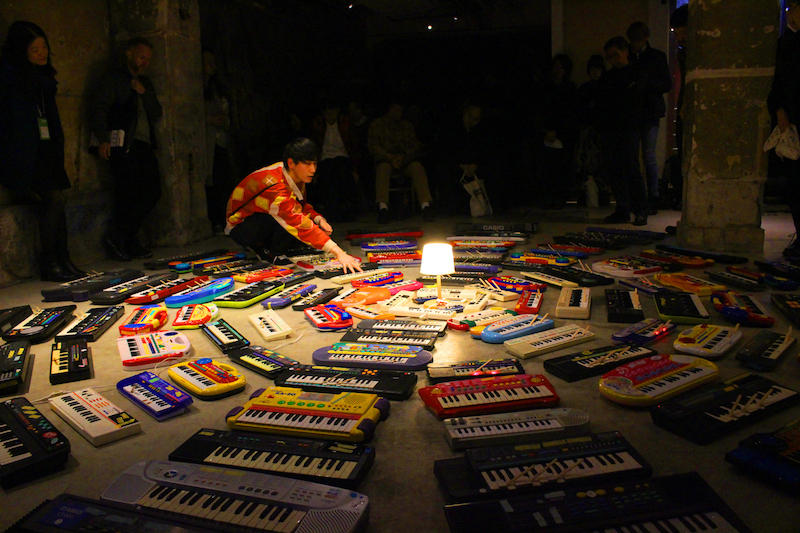 “He plays them using lolly pop sticks and eventually it’s a cathedral of sound,” says Holloway. The dance program will feature New York-born choreographer William Forsythe’s A Quiet Evening of Dance. Forsythe is one of the leading choreographers of his generation, known for his work with Ballet Frankfurt and The Forsythe Company. This program will feature four works – two new, and two that have been seen before including DUO2015, which Sylvie Guillem performed in her farewell program, and Catalogue created for dancers Jill Johnson and Christopher Roman. A Quiet Evening of Dance will come to Australia directly from a season at Sadler’s Wells. “[The pieces] are exquisite with very little music, and a lot of breath,” says Holloway. Other dance events include One Infinity by Beijing Dance Theatre and Australia’s Dancenorth, which features choreographer Gideon Obarzanek, composer Max de Wardener, Australian recorder virtuoso Genevieve Lacey, and Wang Peng from Beijing’s Jun Tian Fang, who are specialists in the ancient Chinese guqin. The theatre program includes a wide range of shows. 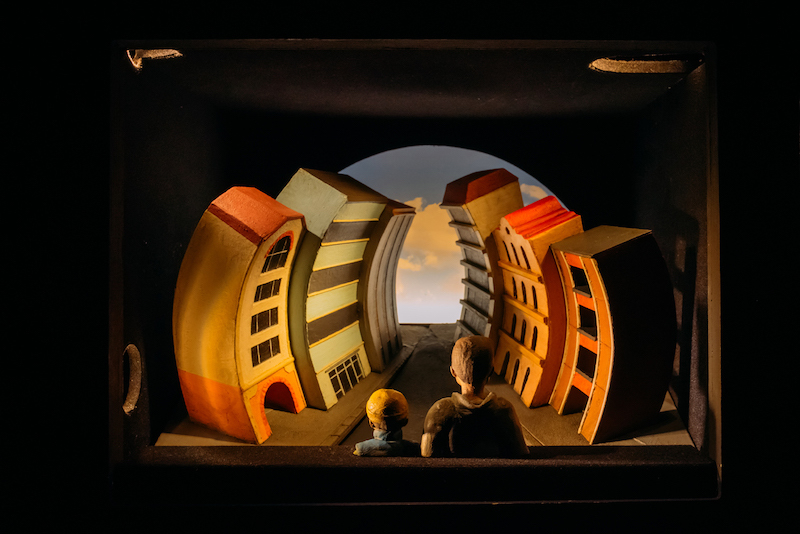 Among them are Flight by Scottish company Vox Motus, which uses dioramas and tiny figures to tell a heart-wrenching story based on Caroline Brothers’ novel Hinterland about two brothers from Syria on a trip across Europe trying to find a home. Tackling one of the major social issues in the world today, Holloway describes the production as “like a graphic novel with a massive diorama that turns slowly, with everyone [in the audience] with headsets on”. Frogman from UK company Curious Directive uses VR headsets to tell a story set in Queensland, which combines live action and virtual reality. Barry McGovern, who is the foremost interpreter of Samuel Beckett, performs Watt, which he has adapted into a play from Beckett’s short novel. Dickie Beau presents a play about Hamlet called Re-Member Me in which he lip synchs to interviews with actors including John Gielgud, Ian McKellen, Kenneth Branagh and Daniel Day-Lewis. “It sounds strange but it is brilliant,” says Holloway. The Festival has co-commssioned Belarus Free Theatre and the Malthouse to create Trustees, a piece of political theatre about the mechanics of authority, the media, self-censorship and freedom of speech in Australia. Other theatre includes Barking Gecko’s A Ghost in My Suitcase based on Gabrielle Wang’s award-winning novel, the award-winning Song for a Weary Throat by Rawcus, Queensland Theatre’s production of My Name is Jimi by Indigenous performer Jimi Bani, who performs with his family, and La Boite Theatre’s production of Prize Fighter by Future D. Fidel about a Congolese boy who comes to Australia as a refugee after escaping a brutal war. The performance forms one of Ma's "days of action", a feature of his six-continent The Bach Project tour which brings him to Australia this November.